With its glowing reviews and sold-out performances, Greg Doran’s staging of Shakespeare’s Julius Caesar for the Royal Shakespeare Company with a cast of black actors was a huge success. Travelling from Stratford-upon-Avon to London and then on tour around the UK and on to Moscow, New York and Ohio, it wowed audiences with its inventive and effective relocation of the story to an unnamed east African country. 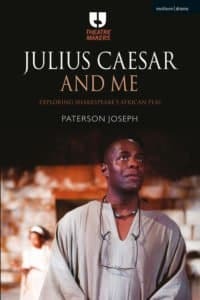 In this new book in Methuen’s Theatre Makers series, the show’s Brutus, Paterson Joseph, reveals what was going on behind the scenes from the first meeting to discuss the concept to the final curtain in Columbus, Ohio. It is honest and revealing, exposing tensions and doubts that reach dramatic levels as friendships are tested by fatigue and familiarity. As the title suggests, this is a very personal account and, alongside Joseph’s probing analysis of his own experience of acting in the production, he draws on how he came to discover and love Shakespeare and theatre as the working-class son of St Lucian parents, growing up in north-west London. Charting his progress through youth theatre to drama school and his first professional roles, he contrasts the challenges facing black and minority ethnic actors back in the 80s and 90s and how diversity is improving, albeit with a long way to go. 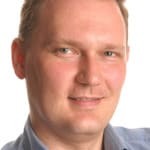 He ponders the difficulties faced by people from disadvantaged backgrounds who want to break into theatre – one of several timely issues touched upon by the book. Joseph also looks at the barriers that deter people from black and minority ethnic communities to visit the theatre and the varying degrees of success in achieving this throughout Julius Caesar’s globe-trotting run. He lucidly explains the thinking and debate behind the decision to set the production in east Africa with black actors, exploring why Julius Caesar has been described by South African director and actor John Kani as Shakespeare’s “African play”. It confirms how this move was much more than a PC gimmick but grounded in an understanding of Africa’s political history, with its track record of freedom fighters seduced by power, and how the play resonated with Nelson Mandela and members of the African National Congress. For actors, creatives and academics, Joseph provides insightful scene-by-scene analysis of the production and the characters, inevitably focusing on Brutus’s relationships, especially with Cassius, his wife Portia and his servant Lucius, played respectively by Cyril Nri, Adjoa Andoh and Simon Manyonda. For theatre makers, the book provides fascinating insights into the challenges of a long run and a tour, where fatigue and tensions led Joseph to decide the production was “irreparably damaged” and, at one point, to quit before realising it would be better to stay on to the end. It reveals how the dynamics of the production changed depending on the space, not just between rehearsal room and stage but during filming for a BBC TV version in a former supermarket in Colindale and the different set-ups throughout the tour, including the impact on the actors from switching from a three-sided platform to a proscenium arch. While the Stratford production was straight through, the addition of an interval at other theatres for the sake of bar sales reveals how commercial needs can present a further challenge to the momentum of what happens on stage. The book also reveals interesting details about Doran’s rehearsal process as well as practical aspects such as how captions can impact on the cast and their experience of previews and press night. Joseph also shares his belief in the importance of “debriefing” for actors to help them shrug off their characters’ personalities at the end of a performance for the sake of their mental health and relationships. Through his illuminating narrative and reflections, Joseph demonstrates an enduring passion for Shakespeare’s plays and a belief that they still have the power to change perceptions and throw light on life and politics today.